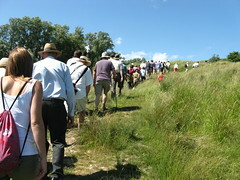 On Sunday 4 July 2010 I joined a Romney Marsh Countryside Project guided walk to the Hythe sound mirrors, and got some better photos for the website. The 30 foot mirror isn’t in a very happy state. There were about 50 people on the walk. More photos at Flickr. As well as the walks to the Denge mirrors, there is one to the Hythe sound mirror this year. A chance to walk up the steep grassy escarpment to the 30ft Concrete Mirror or Sound Dish on The Roughs at Hythe. One of the Mirrors has fallen down and the other is surrounded by fencing, but the views are wonderful. Donation appreciated. Full details at the Romney Marsh Countryside Project website. A photograph from Graeme Hartley, taken circa 1976 when I was about 8 years old , showing him with the Hythe Roughs sound mirror when it was in rather better condition than now. The sound mirrors – and this website – got a mention in the Observer’s travel section on 5 April 2009. The piece formed part of the Military sites” category in a series about Secret Britain – “All around us lie overgrown and forgotten sites with fascinating stories to tell, says Iain Sinclair”. In the middle of a field in Kilnsea, Yorkshire there is a 15-foot-high concave concrete structure resembling a satellite dish. It’s actually an acoustic (or sound) mirror, used during the first world war to detect enemy engine sounds. They are a common fixture along the British coast, including at Kilnsea (OS map ref: TA 411167), Hythe in Kent (OS map ref: TR138344) and Denge on the Dungeness peninsula (OS map ref: TR070215), which recently featured in the new Prodigy music video, Invaders Must Die. Paul Sheersmith went to Hythe in Kent on May 7, and took these photos of the sound mirror there. I intended to go for a walk by the military canal near Hythe today, but was diverted by the sight of the mirror still standing above the Pennypot estate – so decided to clamber up there. Very overgrown near the top – could not walk around the back as the stinging nettles were too high. However fascinating to see – so have been hunting for some more information about them this evening. Remember seeing something on ‘Coast‘ sometime ago. Thanks for the info and the photos – unfortunately we did not have the camera with us today which is most unusual. Last weekend I went down to the 80th anniversary celebrations at the Romney, Hythe & Dymchurch Railway, and in passing confirmed that it is possible to get a distant glimpse of the 200′ listening ear at Denge from a train, if you know where to look. The Hythe mirror is rather more clearly visible, and is shown in the background of a painting of the RH&DR’s armoured train which is being sold as a postcard. Some Easter 2007 photos of the Hythe acoustic mirrors on An English Shooter’s Blog .